CUMBERLAND — Past and present female members of the Cumberland Rotary were honored Tuesday for their efforts in the humanitarian organization. Led by Shirley McIntosh, assistant district governor, the Salute to Women in Rotary recognized the important impact women have had in the local club and in Rotary organizations throughout the world. McIntosh and her committee have spent the last several months preparing for the salute that coincided with the 25th anniversary of a Supreme Court decision mandating that Rotary International allow female members. The movement to open membership to females began in 1976 when the Rotary Club of Duarte in California admitted three women. In 1978, Rotary International revoked the club’s charter for allowing women to join. The Duarte club then filed suit in the California courts, claiming discrimination based on gender. When California courts ruled against them, Rotary International appealed the decision to the U.S. Supreme Court. The U.S. Supreme Court, on May 4, 1987, confirmed the Californian decision allowing women to join Rotary clubs throughout the country. McIntosh said the Cumberland Rotary Club immediately embraced the change and that the local membership is now more than one-third female. President-elect Karen Johnson welcomed guests and emphasized the important role women have played in the past and continued success of Cumberland Rotary. Johnson and her mother, Doris (Henaghan) Fisher, hold a unique position within the group — they are the first and only mother-daughter duo. Fisher was among the first women to join the club. Fisher said she was welcomed warmly by members and has treasured her time as a Rotarian. Throughout the local club’s history, many women have served in leadership roles with great success. Among those individuals is Ann Gormer. Gormer, 83, lived in South Carolina, and is unable to travel to the area but shared her thoughts on the club through a letter read by Shirley Giarritta. Gormer explained that her involvement in Rotary began at the age of 13 when she was asked to play the piano at her father’s club in Berlin, Pa. Many years later, when she joined the Cumberland Rotary, she considered it to be a high point of her life. Club activities and meetings center around the Rotary Four Way Test of the Things We Think, Say or Do — First: Is it the truth? ; Second: Is it fair to all concerned? ; Third: Will it build good will and better friendships? ; and Fourth: Will it be beneficial to all concerned? Barbara Boyd Roque, a former Allegany County commissioner, also sent a letter outlining the significant impact Rotary has had on her life, both personally and professionally. “The Four Way Test has become my mantra and I believe that if everyone had access the world would be a better place,” she wrote in a letter read by Amy Schwab Owens. Rotary International was founded in 1905 by attorney Paul Harris. Harris envisioned a fellowship of men from varying backgrounds without the restriction of politics or religion. Harris and a group of fellow businessmen met for the first time as a Rotary in Chicago on Feb. 23, 1905. Nearly 107 years later, there are more than 33,000 Rotary clubs worldwide, with a membership that exceeds 1.2 million. Guests in attendance for the Cumberland Rotary Salute to Women included members from neighboring clubs, past presidents and dignitaries, including District Gov. Melinda Golden of the Hancock Rotary Club. Karen Johnson was sworn in as President of the Rotary Club of Cumberland in June 2012. 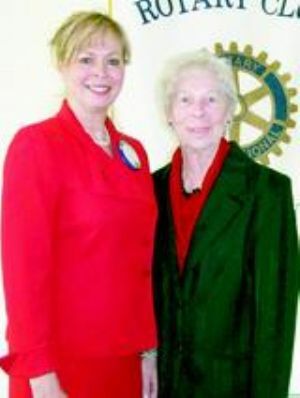 On the left is Karen Johnson, and next to her is her mother, Doris (Henaghan) Fisher (1934-2013), one of the first women members of the Cumberland Rotary.